The Arab Revolt against the Turks in World War One was, in the words of T.E. Lawrence, “a sideshow of a sideshow.” Amidst the slaughter in European trenches, the Western combatants paid scant attention to the Middle Eastern theater. As a result, the conflict was shaped to a remarkable degree by a small handful of adventurers and low-level officers far removed from the corridors of power. Curt Prüfer was an effete academic attached to the German embassy in Cairo, whose clandestine role was to foment Islamic jihad against British rule. Aaron Aaronsohn was a renowned agronomist and committed Zionist who gained the trust of the Ottoman governor of Syria. William Yale was the fallen scion of the American aristocracy, who traveled the Ottoman Empire on behalf of Standard Oil, dissembling to the Turks in order gain valuable oil concessions. At the center of it all was Lawrence. In early 1914 he was an archaeologist excavating ruins in the sands of Syria; by 1917 he was the most romantic figure of World War One, battling both the enemy and his own government to bring about the vision he had for the Arab people. The intertwined paths of these four men – the schemes they put in place, the battles they fought, the betrayals they endured and committed – mirror the grandeur, intrigue and tragedy of the war in the desert. Prüfer became Germany’s grand spymaster in the Middle East. Aaronsohn constructed an elaborate Jewish spy-ring in Palestine, only to have the anti-Semitic and bureaucratically-inept British first ignore and then misuse his organization, at tragic personal cost. Yale would become the only American intelligence agent in the entire Middle East – while still secretly on the payroll of Standard Oil. And the enigmatic Lawrence rode into legend at the head of an Arab army, even as he waged secret war against his own nation’s imperial ambitions. Based on years of intensive primary document research, LAWRENCE IN ARABIA definitively overturns received wisdom on how the modern Middle East was formed. Sweeping in its action, keen in its portraiture, acid in its condemnation of the destruction wrought by European colonial plots, this is a book that brilliantly captures the way in which the folly of the past creates the anguish of the present. Page-turning, well crafted historical treatise of T.E. 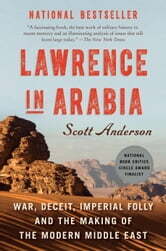 Lawrence's pivotal role in the Arab Revolt while countering imperial meddling before and after WWI. Highly recommended. Review title says it all! Good analysis of the Middle East situation from the beginning of the 20th century.